In 1649, with the execution of the supreme governor of the Church of England, Charles I, the religious world really was finally ‘turned upside down’ for many ordinary people. 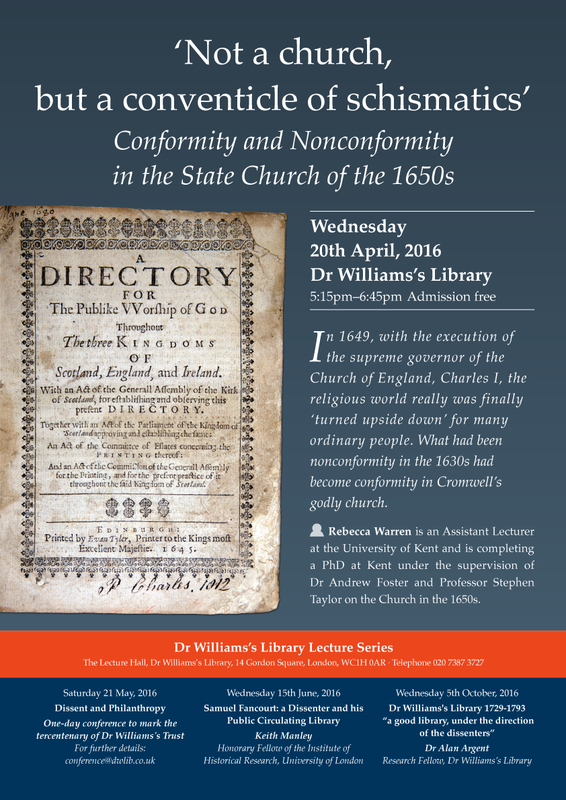 What had been nonconformity in the 1630s had become conformity in Cromwell’s godly church. This paper draws on a larger research project on the nature of the state church in the 1650s, to consider the impact of this reversal of conformity and nonconformity on the experience of parochial worship. Rebecca Warren is an Assistant Lecturer at the University of Kent and is completing a PhD at Kent under the supervision of Dr Andrew Foster and Professor Stephen Taylor on the Church in the 1650s.